I started in the fish hobby with my first aquarium when I was nine years old. I became fascinated with fish and developed an interest to learn as much as I could about them. I went on to college, majored in Zoology, and got my first job working with fish. I did an internship at the Philadelphia Zoo working with the Jersey State Aquarium design group. By then, I’d kept aquariums for over ten years, but working in a public aquarium sparked my interest even more. After the completion of the internship, I decided to go back to school and pursue a Master of Science degree specializing in fish reproduction. Upon completion of my master’s degree, I worked in a public aquarium teaching Docents and volunteers about the biology of invertebrates in the inter-tidal exhibit. My love of fish and teaching others about them has led me to the retail business of selling fish and aquarium supplies. 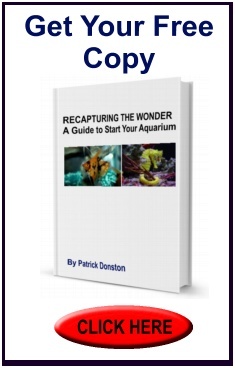 For the thousands of hours I have spent working on aquariums, I have experienced nothing but admiration for these creatures which can best be described as freedom, joy, and love for a spellbinding wilderness that we can bring into our homes. I believe aquarium keeping is one of the best educational tools for children and adults to learn more about the oceans and reefs around the world. Learning about the animals one has as pets sparks an interest to become more aware of the environment we live in. It can bring people closer to a part of the world they may never see or otherwise know. 8, 2002 speech on Marine Fish, Keeping Them Healthy. the customers from whom I learned so much. – Patrick. zoology of animals on display in the inter-tidal exhibit.